Members of the European Parliament request more clarity before voting on the Commission's proposed trade deal for Western Sahara. Meanwhile, 93 Western Sahara civil society groups lament the Parliament rapporteur's lack of diligence on the file. Yesterday, 5 November 2018, in the European Parliament's International Trade Committee (INTA), Patricia Lalonde (French liberal) presented her report on extending the EU-Morocco trade deal into the parts of Western Sahara that are under Moroccan occupation. MEP Lalonde favours the extension, saying it will bring benefits to the "local populations" and that the development of the territory must be furthered. She had witnessed that development firsthand, she claimed, as she also presented her report of the INTA fact-finding mission to Western Sahara in early September. Find that mission report, and Western Sahara Resource Watch's evaluation thereof. Western Sahara civil society: "MEP Lalonde's report has no basis"
93 Civil society groups from Western Sahara on 5 November 2018 sent a letter to the European Parliamentarians, calling for suspension of Parliament's assessment of the proposed trade deal until key-issues have been dealt with: the territorial integrity of Western Sahara, and its people's right to consent, must be respected, the organisations state. "The conclusions included in the draft report of MEP Lalonde favouring the application of the EU-Morocco liberalization agreement have no basis, in the absence of a profound and thorough investigation. The report is biased in favour of the Moroccan occupier and disrespects EU position of not recognizing Morocco’s sovereignty over the territory and undermines international law and UN peace efforts", the letter reads. Read the full letter here.In her argumentation, MEP Lalonde did not refer to the will of the people of the territory - the cornerstone principle of the ruling of the Court of Justice of the European Union of December 2016. The ruling concluded that no EU-Morocco trade or association agreement could be applied to Western Sahara unless with the express consent of the people of the territory. That conclusion triggered the EU to start negotiations with Morocco for an amendment to two Protocols to the EU's Association Agreement with Morocco, so that it would henceforth apply explicitly to Western Sahara. The European Parliament is currently in the process of evaluating whether or not to support that amendment, which would result in a trade arrangement for Western Sahara through Morocco - the country that holds two-thirds of Western Sahara under military occupation since 1975. Remarkably, the trade preferences granted to Morocco will be extended only to the part of Western Sahara that is under Moroccan occupation - not to the part controlled by Polisario that is east of the Berm; the militarily fortified 2700km wall that Morocco built during the war years, which to date effectively divides the territory and separates Saharawi families. MEP Lalonde did not address why the supposed benefits would only be destined for one part of Western Sahara and not the other, nor how this effective re-drawing of international borders holds under the EU's duty of respecting territorial integrity. Read WSRW's questions to EU Commissioner Moscovici on that matter here. 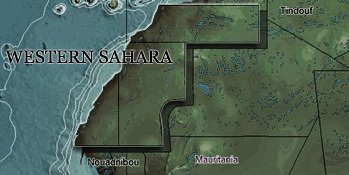 Western Sahara is recognised by the UN as a non-self-governing territory under decolonization. The territory has clear international borders. While several shadow rapporteurs (Salvatore Cicu (IT) for EPP, Elena Valenciano (ES) for S&D, Sander Loones (BE) for ECR and Tiziana Beghin (IT) for EFDD) considered MEP Lalonde's report to be balanced, the other shadows (Heidi Hautala (FI) for the Greens/NGL and Anne-Marie Mineur (NL) for the GUE/NGL) and literally all other MEPs taking the floor - including of the above-mentioned political groups, remained critical of the proposal. Two main points of critique were expressed: that the people of Western Sahara had not consented to the proposed trade deal for their territory, and that there is no mechanism included in the proposal that will allow for clarity on the true origin of products being exported from the territory. "The European Court of Justice called for the consent of the people of Western Sahara? So what did Polisario say? ", asked German S&D Joachim Schuster. "MEP Lalonde says she is in touch with the UN Envoy for Western Sahara. What does he say? Will this proposal stoke the conflict or help to resolve it? These are important questions to have answered." "I think very few of us would say that it is normal to make a trade agreement with Russia for Crimea", stated Heidi Hautala, who was one of the three MEPs that took part in the fact-finding mission. "It seems the Commission and some of the political groups want to have their cake and eat it too - this is not serious." Aleksander Gabelic (Sweden, S&D) pointed out that "the UN recognised representative [Polisario, Ed.] and the Western Sahara civil society are negative to the proposal." "Our own legal service says that the consultation conducted by the Commission is wishy washy", said Marie Arena (Belgium, S&D), referring to the Legal Opinion issued by the European Parliament's legal services that concluded that it was unclear whether the CJEU's requirement of a consent by the people of Western Sahara had been met, "also taking into consideration that the conclusion of a positive consent is reached in spite of the negative opinion expressed by the Polisario Front." All MEPs agreed that a traceability mechanism should be in place, preferably before January 2019 when the Parliament is expected to vote on the proposal. The Commission, represented by Ms Sabine Henzler, focused primarily on the questions regarding the need for a traceability mechanism, and assured MEPs that the Commission is in talks with Morocco on the matter. On the issue of consent, Ms Henzler stated that it is not because the UN regard the Polisario Front to be the political representative of the people of Western Sahara, that Polisario can be considered to be representative in matters of trade. She went on to say that the Commission has done "all that is possible and feasible" to get the consent of the people, through a consultation exercise. Mr Vincent Piket, representing the EU External Action Service, added that Mr Horst Köhler - the UN Envoy for Western Sahara - does not have a position with regard to the proposed trade deal, other than that the EU should respect international law and should not act in a way that jeopardizes the UN process for Western Sahara. "Our proposal meets those conditions", Mr Piket concluded. The International Trade Committee will vote on MEP Lalonde's report on 3 December 2018.